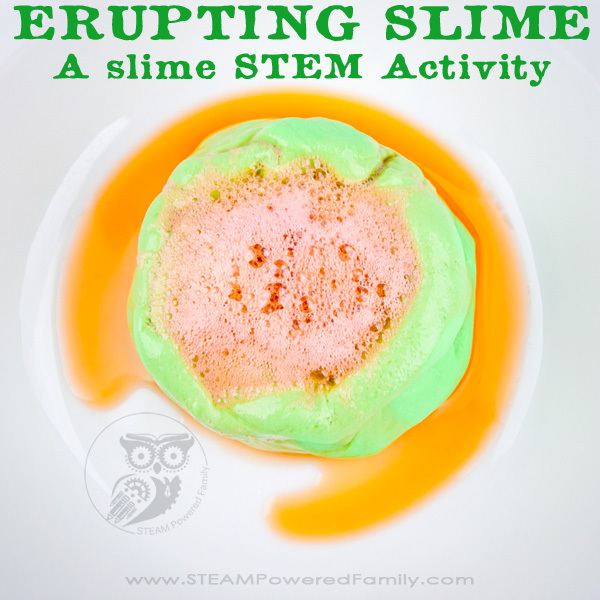 In the past we have made lots of slimes and lots of different oobleck recipes. 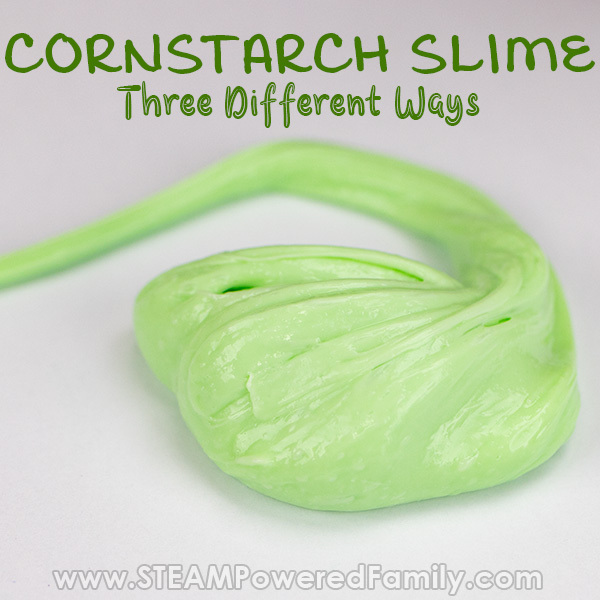 Recently someone asked me about cornstarch slime. 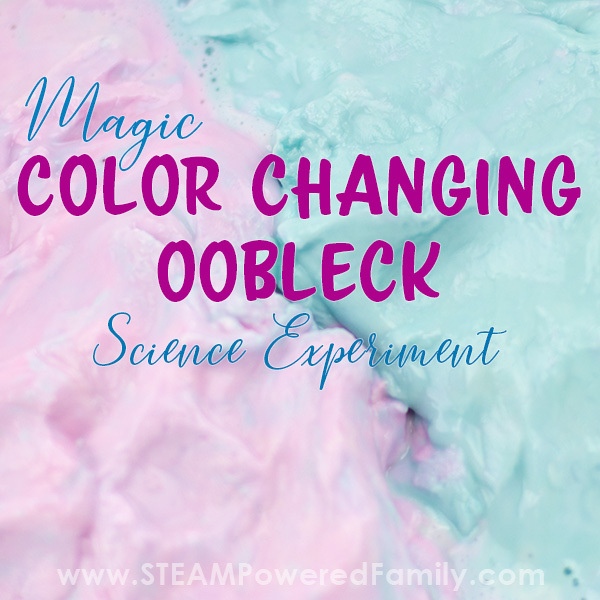 I thought they meant oobleck, but they assured me they meant a slime made with cornstarch. Our interest was peaked so we pulled out our bin of oobleck and slime making ingredients and set to work on making slime with cornstarch as many ways as we could possibly imagine. 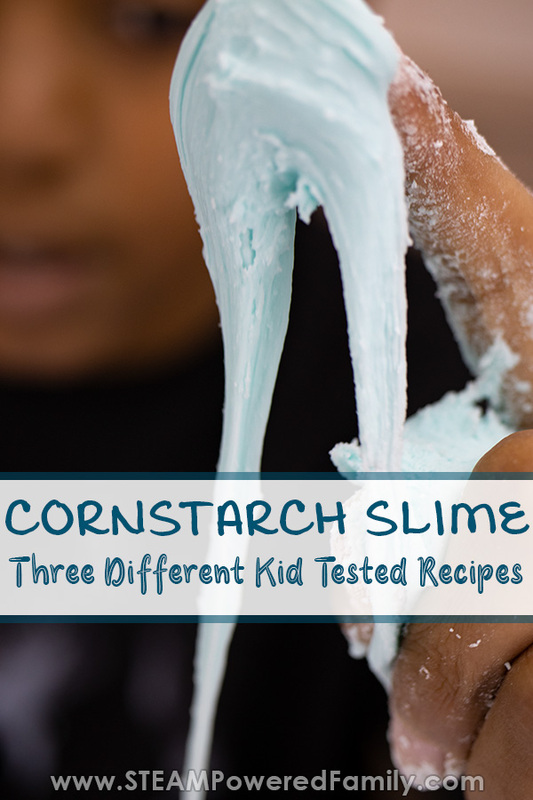 Here are our top 3 recipes for cornstarch slime after extensive testing and quality control by my kids. 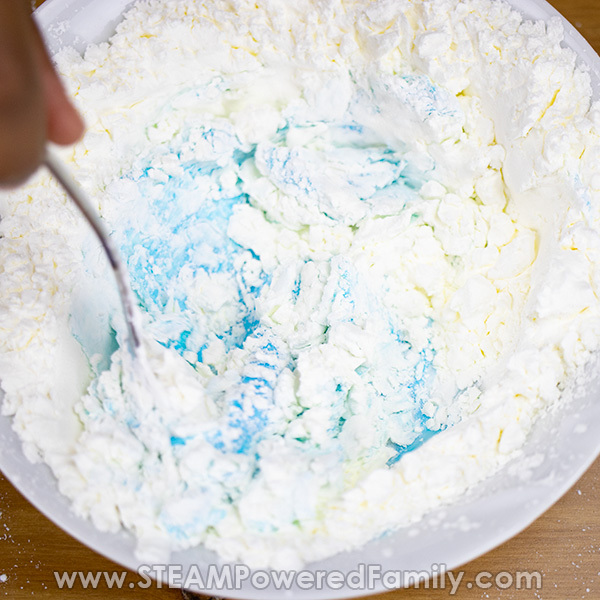 Cornstarch is the most popular ingredient in oobleck. 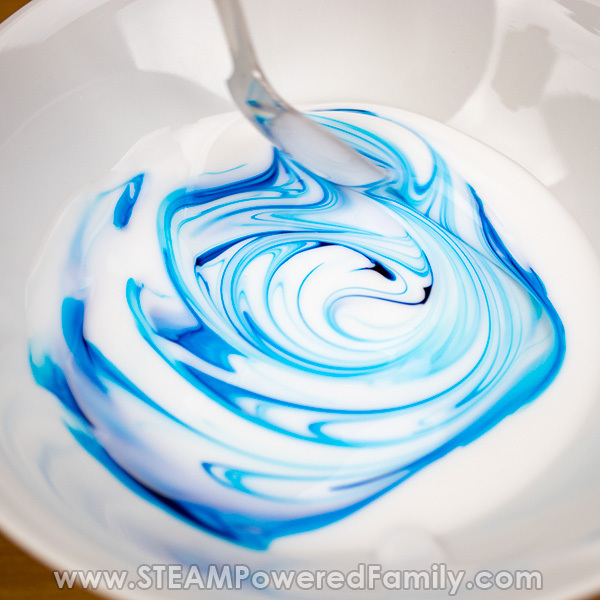 We know when mixed with water or other liquids it forms a non-Newtonian Fluid. So the idea of mixing it with something else, like glue, set our scientific inquiry loving minds into high gear. 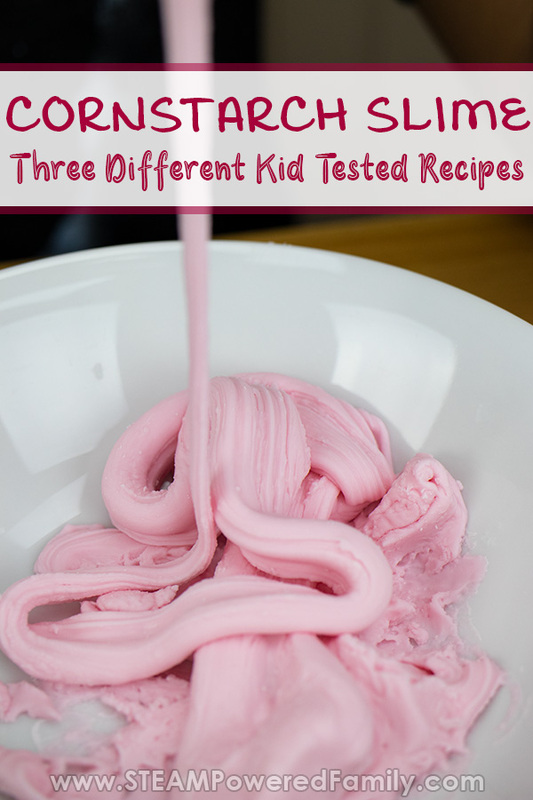 For this experiment we tested a number of different gloopy, gooey concoctions. Many of them were horrible failures (yes I have glued my fingers together! 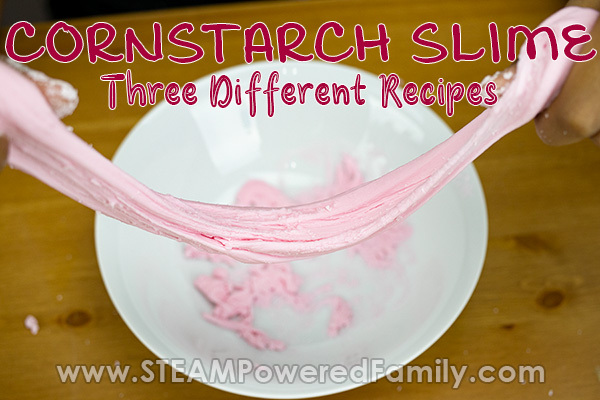 ), but we did find 3 recipes that created some pretty nice slimes. The first one uses only 2 ingredients. The last one is crazy stretchy! So we have a cornstarch slime for everyone here. 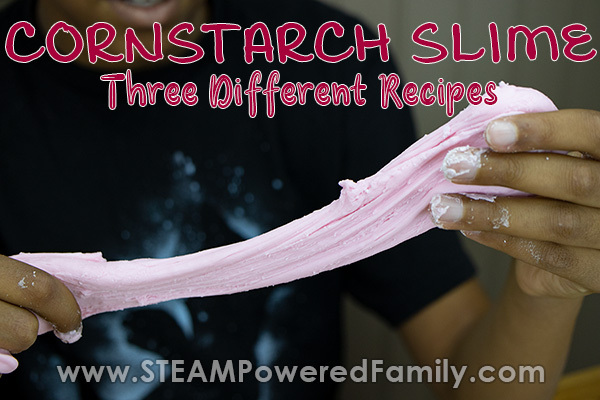 The first recipe is super easy, simply mix cornstarch with glue. If you want your slime coloured you should add some food colouring first to your glue and mix it well. Then start adding cornstarch. We found it required a ratio of about 1 to 3 for glue to cornstarch. So if you use 1/4 cup of glue, you will need about 3/4 of cornstarch. It is not exact. The kids I admit are not perfectionists when it comes to measurements but that should give you a pretty good guideline. The key with this recipe is to really knead and work it all together. This will eventually reduce the stickiness until you end up with your slime. Now it is not the most slimey or stretch of slimes. In fact I would qualify this more as a stretchy play dough in my option. But the kids still had fun playing with it. And other than needing a LOT of kneading, it was very easy to make. For our next attempt we decided we wanted something more slime like. By that I mean we wanted something with more stretch. 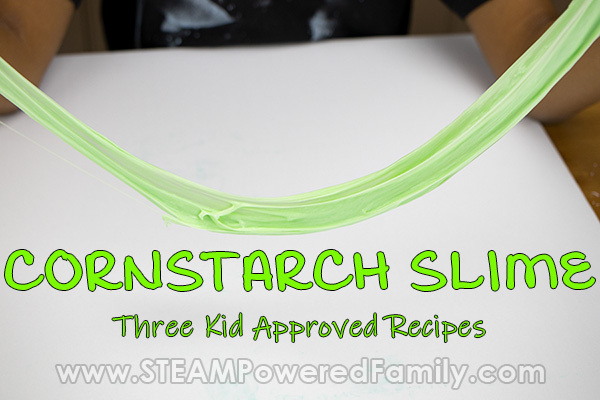 The first recipe was OK, but when we are playing with slime we like really stretchy slime. We tried a few different things but eventually found adding a tablespoon of glycerin helped to create a much stretchier cornstarch slime. For this recipe we once again used 1/4 cup of glue that we coloured with some food colouring. Then we mixed in a tablespoon of glycerin. 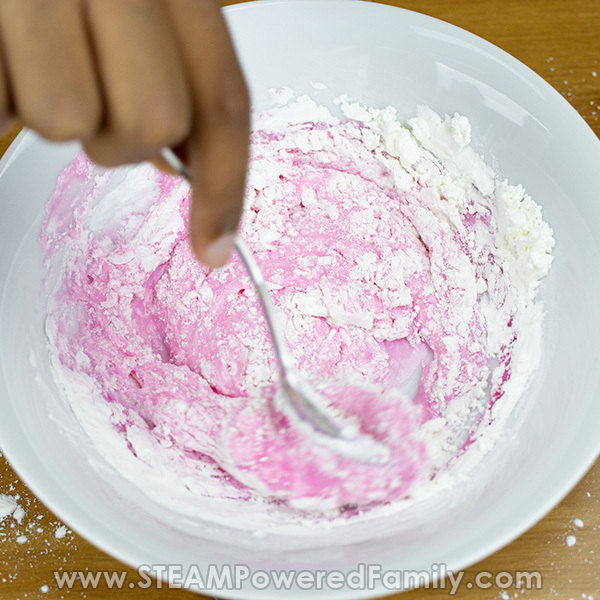 Once it was all mixed together we started adding cornstarch. We found it easiest to add 1/4 at a time, with lots of mixing in between (by this point we had made a lot of cornstarch slimes!). In total we once again used 3/4 cup of cornstarch, keeping to our ratio of 1:3. The glycerin made a HUGE difference in the quality of the slime. It was much smoother and stretchier and behaved more like our regular slime. Not quite the same. There was still a bit of that thickness and stiffness of play dough, but it was much better. We had a lot of fun with this batch. 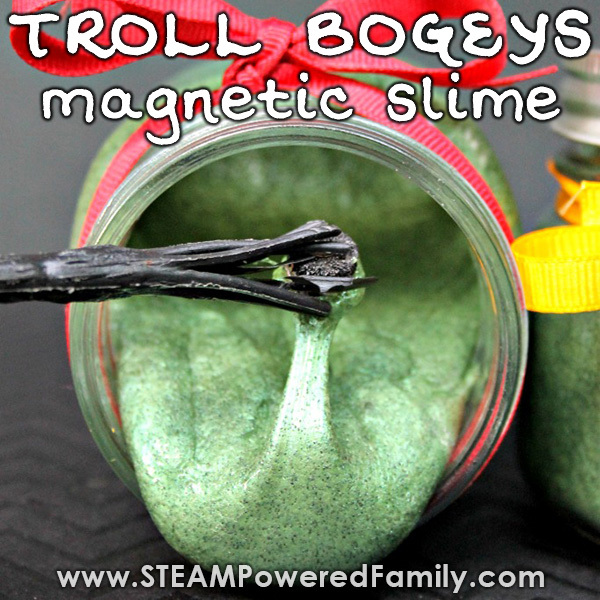 When we originally started making slime we got a LOT of questions from people that struggled with the recipe. I am honestly still not sure how people struggled with it, as it is so easy but they did. One of the biggest issues was not using the appropriate amount of contact lens solution. This resulted in either a slime that was too sticky or way too stiff. Now there are a few ways you can try to save failed batches but we had an idea… what if there was a way to make it easier to remove the sticky without risking adding too much contact lens solution? 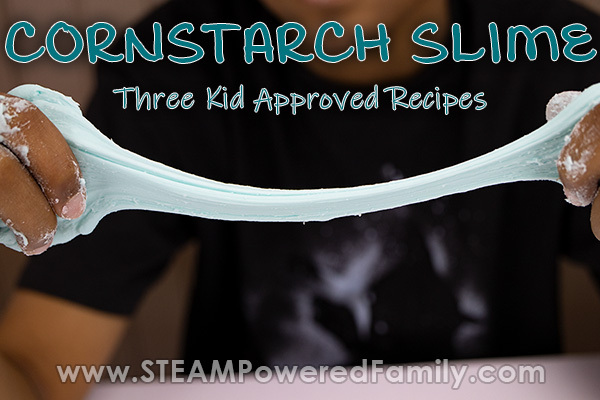 With that our final cornstarch slime recipe success was born! We started with our usual slime recipe. 1/4 cup of glue with a teaspoon of baking soda mixed in along with a bit of colour. Then we added 1 teaspoon of contact lens solution and mixed until it was pulling nicely into a sticky lump. Now normally at this point we would be adding more contact lens solution and mixing but this time we tried something different. We added 1/4 cup of cornstarch and started kneading it in. Very soon all the sticky was gone and we had a wonderfully stretchy slime! 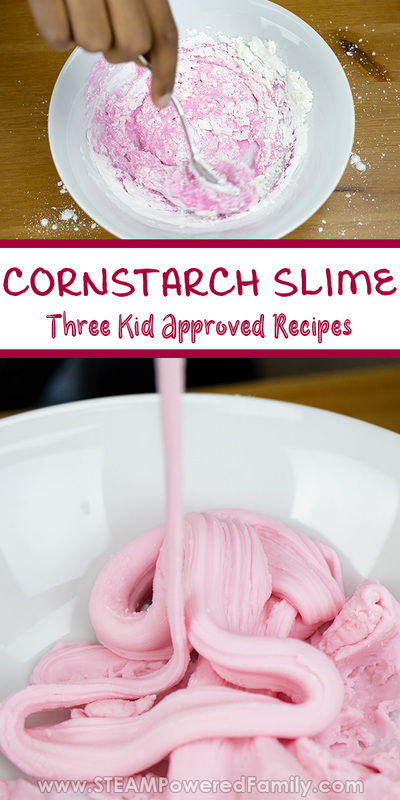 So in our opinion recipe number 2 wins as our favourite cornstarch slime recipe followed by number 3. The issue we have with number 3 is that if we are going to make our slime that way, we will just stick to our old recipe. But if someone is struggling with the old recipe this gives them a viable alternative. Number 2 wins over the first recipe because it has way more stretch and a more slime like texture. Next time we will be making it with potato starch! After discovering how much better our oobleck is with potato starch I am curious what it will do to this slime recipe. I’m sure it will be a silky, wonderful texture just like the potato oobleck. These recipes actually came out of our research and testing to develop a DIY Starlite material. This material has incredible heat transfer protection properties that you need to see to believe. 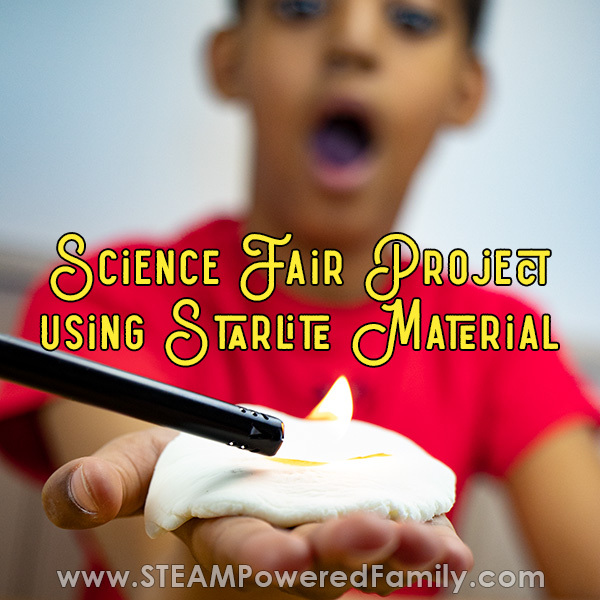 Our experiments with fire and Starlite make a fantastic middle grade science fair project or as a classroom demonstration to wow students. It’s one of the most incredible experiments we have ever done with massive WOW factor. 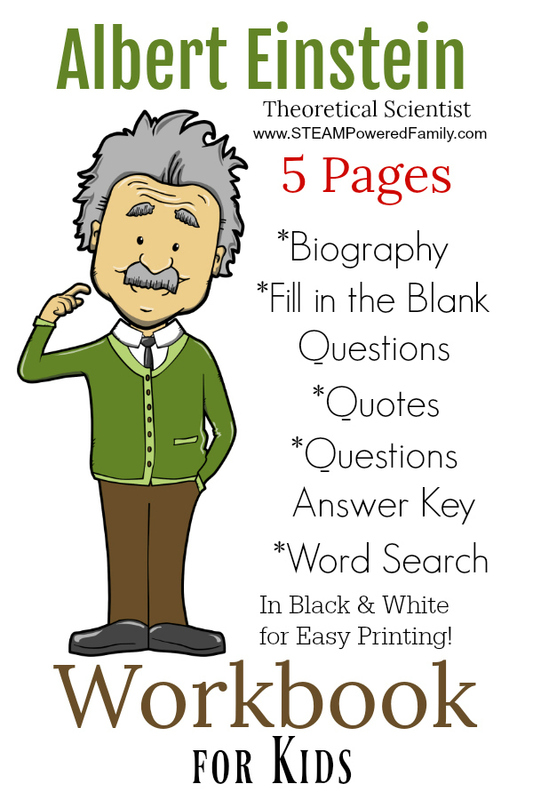 I love how one experiment spins off into all sorts of new inquires and investigations!